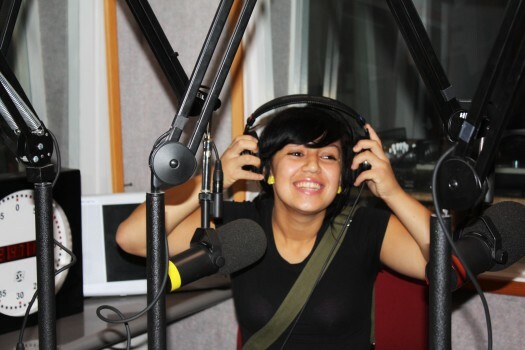 Feminist Fatale » Global Girls Hit the Airwaves on KPFK Radio! 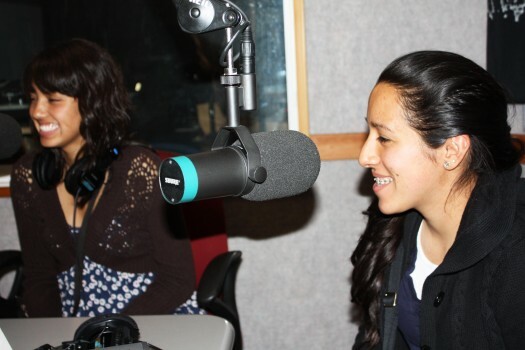 Global Girls Hit the Airwaves on KPFK Radio! 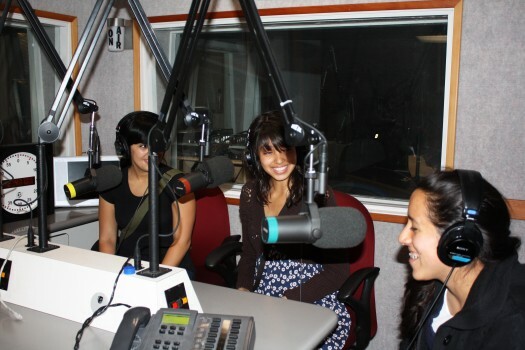 Yesterday I had the pleasure of accompanying three of the eight global girls of Global Girl Media, a program “dedicated to empowering high school age girls from under-served communities through media, leadership and journalistic training to have a voice in the global media universe and their own futures,” to a radio interview at KPFK Radio in Los Angeles. Their blog accounts of yesterday’s experience on the radio follow below. Originally posted at Global Girl Media, LA Academy blog. Cross-posted with permission. Yesterday, June 21, 2010 Brenda, Sussete, and myself took a trip to the KPFK Radio studios in North Hollywood. Professor Melanie Klein, who had kindly agreed to chaperone, and I got there first and we waited in the lobby for the two other girls to arrive. Once they got they got there the room suddenly seemed tiny. I think this is when my nerves started to hit. Once we met Alan Minsky, the host of the soccer show “The People’s Game” I knew the time to be interviewed was getting close. I shared with Brenda that I was getting nervous. She said to me, “Jessica, your nervousness is contagious. Now I’m nervous.” Alan gave us a tour of the studio and introduced us to Jennifer Doyle who would be interviewing us. We finally made it to the recording room and tested everything before the interview started. At this point I was so nervous, I could hear my heart pounding and my hands were shaking. When Kamala told us we were going to be interviewed on KPFK something snapped in me that said “GO!” So I agreed to go. For some reason I wasn’t as nervous as I thought I should be. I mean in my mind this was a million times easier than having to speak in front of a camera. But as I rode in the car with Sussete to the Radio Station I began to question my confidence. The thought of this being live on a air ate at me. What if I choke? What if I forget something? We arrived at KPFK Jessica was already there. “Gosh I’m nervous,” Jessica revealed. “Me too,” Sussete added. I certainly didn’t want to add to the nervousness so I said ” Don’t worry we’ll be fine just pretend were having a conversation with each other, feel free to look at me I won’t make a funny face.” But as we waited for Alan Minsky I was infected with Jessica’s nervousness. As Alan gave us a tour of the station I imagined myself saying something and suddenly blanking out. All these negative thoughts vanished when I met Jennifer Doyle in the room where people are interviewed live. We were lucky, we weren’t going to be live. But something about Jennifer really made me feel like this wasn’t going to be hard. I ran over and over in my head possible questions and answers as we headed into the room where we would be recording. We got comfortable and put on the headphones. I realized I shouldn’t worry about what would be asked because I was prepared, I knew everything I had to know. As we began the interview I realized that Jessica and Sussete didn’t look as nervous as they did when we entered the room which made me really happy. The author clearly enjoys working in radio. I was satisfied with the results, it really did sound as though we were just having a conversation. I would love to do it again and I can definitely see me and the Global Girls back on the radio soon — this was just the beginning. I arrived to the radio station and just kept thinking to myself, “You better not mess up! It’s going to be live!” My nerves were getting the best of me as I awaited the guy from the radio station. I heard the clock ticking and as the minutes went by, my heart was just beating faster and faster. 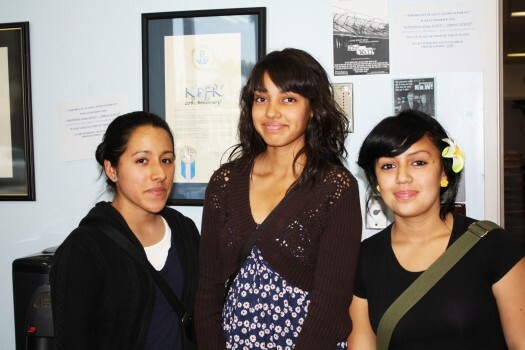 Jessica Cueva, Brenda Solis and Sussette Nuñez upon arriving at the station. Alan gave us a grand tour and it was just amazing seeing the all the different things a radio station has. We saw the music director’s office, the live studio, the pre-recording studio and so much more. As we headed upstairs, we learned that we were going to pre-record our interview with Jennifer Doyle and I just felt a huge weight lifted off my shoulders. I felt less pressure and this just boosted my confidence way more. Putting on those headphones and talking into the mic felt like such a surreal experience. I thought it was awesome being able to hear myself tell a story with just the sound of my voice. No camera, no visual, just me with my headphones and the mic. We began by introducing ourselves and then we jumped into talking about the World Cup. We also discussed what we have learned from our involvement in Global Girl Media and what kind of stories we are currently working on. The author feels at home on the mic. As we wrapped things up, I was content with myself because I felt like I did a good job. Alan and Jennifer were impressed with the Global Girls and just enjoyed our company. 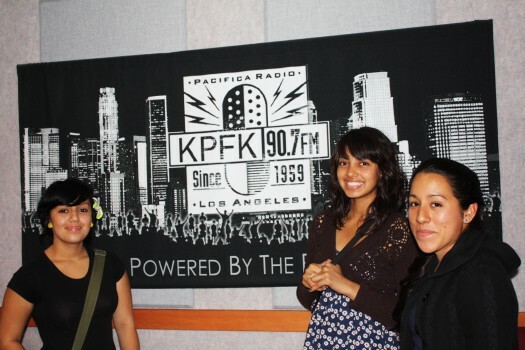 The Global Girls Kick it Up on KPFK. All photos courtesy of Melanie Klein.